Four days fly by awfully quickly when you're in paradise. At least, here in Naples, it seems like paradise. The southwest Florida humidity has given way to cooler, drier, air, the rainy season is over and gone, and temperatures hover around the mid-80's during the day. Best of all, the snowbirds haven't arrived, so traffic is light and there are no long lines in restaurants. Sometimes when we travel here to our "second home," it takes me a while to unwind from the pressures of work and family life back in Michigan. This time, though, I could feel my spirit relax the minute we stepped off the plane into the familiar palm tree lined landscape. Since the day we arrived was my husband's birthday, we headed out to our favorite "celebration" restaurant, Bistro 821, on Fifth Avenue. Other than a few people gathered at the bar, we were the only diners in the place for most of the evening. That never happens during "season," when you must make a reservation at least several days in advance. 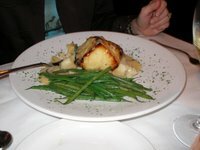 My favorite dish is a miso sake roasted Chilean sea bass, served with garlic mashed potatoes. It's absolutley the best fish I've tasted anywhere, and I order it every time I go to the Bistro. Jim's birthday present from all of us was a new road bike, so part of our first full day was spent at Naples Cyclery, where we picked out a neat black and silver 21 speed bike for him. He decided it would be lots more fun riding with a partner, so (lucky me!) I got a new bike too! Our community is the perfect place for bike riding. There are five miles of smooth blacktop roads, plus lots of little inland lakes with bridges everywhere, giving you an opportunity to play with some of the 21 gears! We dutifully rode our five miles every morning, and I've never enjoyed exercise quite so much. The remainder of the trip was spent "just hanging out," as my son calls it, which translates into reading, napping, eating, shopping, and general relaxing. We made a trip to the beach, where the water in the Gulf was the perfect temperature for wading. 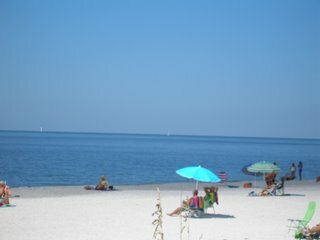 Naples is one of the fastest growing communities in Southwest Florida. It's an old resort town, and there are LOTS of very rich people here, both long time residents, and the "nouveau riche" who come to spend winters in palatial, movie star style homes lining the Gulf of Mexico. Our home is certainly not in that category, but it seems spacious to us. 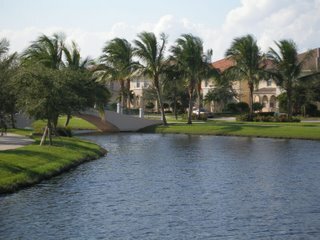 It has the bright, wide open feel that I love, with lots of windows overlooking some of the many lakes and fountains in the community. The community itself is very resort like, with large swimming pools and tennis courts within walking distance, as well as a restaurant, hair salon, and post office. When we visit during the most crowded times of the winter season, I'm perfectly happy to hoard some groceries, bring along lots of videos and books, and just cocoon myself here where I can relax, with all the comforts of home. Of course, much of the charm of Naples is in the fact that our son and daughter in law live here, too. As a matter of fact, they're currently within an easy bike ride of our home. But, they're "movin' on up," as the saying goes, and we spent yesterday afternoon walking through the construction site of the new, larger home they're building. 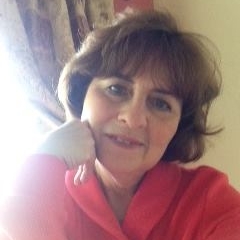 (Their home here in Island Walk is on the market, so if any of you are interested in joining me here in paradise, click on the handy link at the top of the page for more info.) Luckily, they've chosen to build their new home in a new community right next door, so they will still be within bike riding distance. I've recently been posting a lot lately about my home in Michigan, and, as much as I love this tropical paradise we call our second home, that's exactly what it is - a "second" home. How lucky we are to have it, when the cold winter winds blow, and the fast paced, stressful life of the city becomes overwhelming. And especially when we need a hug from our kids -that alone, makes anyplace a paradise!